Bishop Miege senior swimmer Aleksei "Lex" Hernandez-Nietling, who recently signed with Utah, puts swimming in the spotlight at a school dominated by football and basketball. ROELAND PARK, Kan. — Football and basketball generate most of the attention for Bishop Miege athletics, but the private school is loaded with talent in several other sports. Take Stags senior swimmer Aleksei "Lex" Hernandez-Nietling, who won two Kansas Class 5-1A state championships in 2018 — the 100-yard freestyle (45.84 seconds) and 100 breaststroke (57.09) — and also swan on the first-place 200 yard medley relay (1:36.79). Hernandez-Nietling also is the Missouri Valley record holder in the 100 individual medley and he's a three-time Missouri Valley All Academic participant (2016, 2017, 2018). a three-time Kansas State High School all-star (2016, 2017, 2018) and a USA Swimming Scholastic All-American (2017). Now, Hernandez-Nietling can add the Hy-Vee 41 Five-Star Athlete of the Week to his resume, an honor that surprised him despite his success. "I never thought that day would happen," Hernandez-Nietling said. "I remember freshman year, I'd always see all the other athletes getting recognized and I was like, 'Wow, I wanna be just like them.' For that to come true, it's really just unbelievable, and I'm at a loss for words." Bishop Miege athletic director Andrew Groene was less surprised that Hernandez-Nietling's excellence was recognized. "He's able to bring a sport that's not always in the limelight, swimming, to the forefront of people's eyes, people at Bishop Miege," Groene said. "People know how successful he is, and it's not because he goes and tells everyone. It's because people share it. He's very modest with his accomplishments. It's the other people that share the story more than he might even." Hernandez-Nietling recently signed a national letter of intent to swim at the University of Utah in the Pac-12 Conference next fall. "As soon as I stepped on campus, I was like, 'Wow, this is where I wanna be for the next four years,'" Hernandez-Nietling said. "The team instantly brought me in and I really truly felt like it was a family there. And they are on the rise. I'm just excited to be a part of it as we go up." Next week, Hernandez-Nietling, a United States/Mexican dual citizen, will travel to Mexico and face the best junior swimmers in that country, hoping to put himself in a position to qualify him for the Mexican Olympic trials. "We saw an opportunity to be able to go over there and swim in like a summer national championship, and since then we've been drawn back in just for the opportunity and to help keep my dream alive which is to make an olympic games," Hernandez-Nietling said. "Constantly going back there and racing all the fast people over there, it's just an awesome way to see something different, race different people and also just live out the dream." 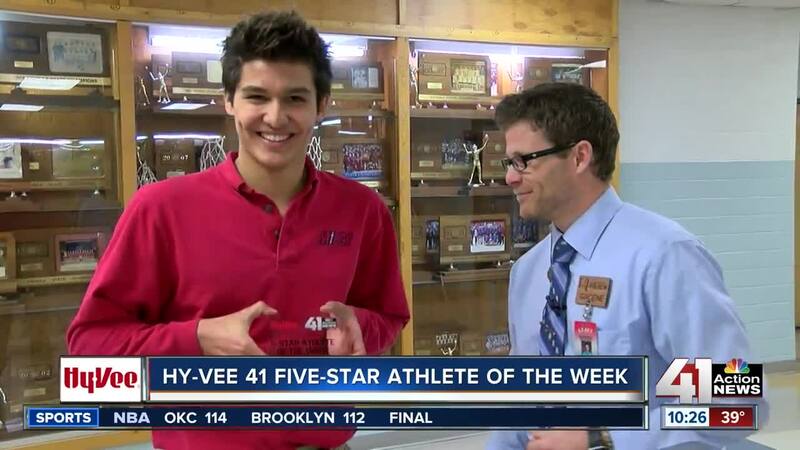 Note: The Hy-Vee 41 Five-Star Athlete of the Week airs in the 10 p.m. newscast each Wednesday during school year.